Increasingly people are thinking about how to better promote electric vehicles at the national level and in key states. Our experience over the past few years underscores the importance of directly introducing prospective customers to these new exciting vehicles in order to drive EV adoption. 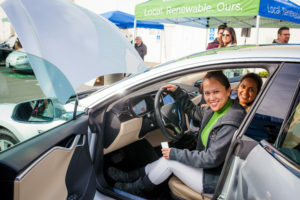 EV test drive events offer people an opportunity to learn more about the latest vehicles. The focus on the consumer showroom experience underscores a key weakness in the overall advocacy strategy promoting electrification. Vehicle sales are ultimately the province of automakers and their dealers. If consumers don’t have access to vehicles or a willing dealer network, they simply won’t be able to purchase electric cars. That disconnect can be presented as consumer disinterest rather than a readily resolvable market breakdown. Electrification advocates have a unique strategy asset to blunt the weakness – the ability to assemble vehicles from multiple manufacturers for test drives outside a typical dealer experience that include consumer survey feedback on the experience. Through the process, a strong rebuttal point for the consumer interest argument emerges – test drive data show that consumers are overwhelmingly more likely to buy electric vehicles after even their first test drive. Well-structured test drive events aimed at high likely to purchase consumers can generate 10% conversion rates – on par with any industry standard for acceptability. The long-standing national tradition of having annual auto shows was built on the idea of achieving similar conversion rates. Moreover, advocates – be they government entities, public interest stakeholders, or even private sector hosts – can create test drive settings in a way that the industry cannot. Vehicle manufacturers don’t typically like to show their cars with other brands; well-structured test drives overcome that obstacle by pulling various brands together. Car companies tend to group their product marketing towards particular tightly-banded price-point segments; test drives can assemble a range of vehicles at different prices points to underscore the wide range of options available for consumers. Ride and Drive events are designed to be fun and informational with no pressure to buy. Overcoming confusion about electric vehicles requires an education process dealers are poorly positioned to support; test drives provide a stress-free setting outside of a sales environment where difficult questions can be resolved. Locating vehicles for a first try can be time intensive for individual consumers; test drives overcome that challenge and save significant time. Finally, advocates can select test drive locations that are targeted at likely to purchase consumers; by “going where the fish are” advocates can develop data underscoring the strong interest in electric vehicles among consumers when they actually have access to the vehicles. First-hand experiences can drive electric vehicle adoption. Include a wide array of sponsoring participants. Sponsors could receive training so that individual test drives included consistent components and survey collection. Even though the way forward on electrification is still evolving, the over 570,000 vehicles on US roads – let alone the over 1.2 million on roads globally and ongoing rapid technology improvements across the sector mean that the age of vehicle electrification is coming. It’s no longer a matter of it, only of how fast. Given that electrification is a centerpiece of any meaningful scenario for achieving important greenhouse gas emissions reductions, action now to demonstrate the importance and viability of the market will be crucially important to speed the transition. Vehicle test drives provide one very persuasive method for achieving that goal.